On Monday, 9th of Feb 2015, Honda published a full page back cover ad in The Hindu Chennai edition declaring that it is cheaper to go to Bengaluru from Chennai in a Honda Mobilio, than in a public transportation AC Bus. I would usually ignore the ads and don’t bother writing a post explaining why it is wrong. But this one was about the Chennai-Bengaluru travel by road and having traveled countless number of times between these 2 cities, I couldn’t keep quiet when a full page add full of lies is so blatantly published. This Ad is full of misrepresentation of facts. The person who drafted this advertisement and one who approved it have either never traveled between Chennai and Bengaluru by road, or are knowingly stating false numbers to cheat prospective customers. I am sure Honda would have given similar ads in other cities, stating that Honda Mobilio will be cheapest way of reaching a nearby destination city. Keeping above ad as a reference, this post is an analysis of travel cost between Bengaluru and Chennai, between various modes of transportation. 1. Massive toll charges: For a one way travel in a car, it costs between Rs 400 to Rs 700 one way, depending on the road chosen. (Road via Chittoor and Kolar has fewer toll booths, you can save a bit if you avoid electronic city flyover and in Kancheepuram using alternate roads). Since neither Honda mobilio is exempted from toll, nor will Honda reimburse the toll expense, this cost should be added to trip expense. 2. Unrealistic mileage. Honda’s calculations are based on certified mileage of 24.5. When a car is loaded with 7 people, their luggage and AC is ON, expected mileage is around 15-16 kmpl or less, assuming very economic style of driving. That is simply Rs 1100-Rs 1300 worth of diesel for about 350+ kms. 3. Bus ride is much cheaper, not Rs 999 as shown in ad. 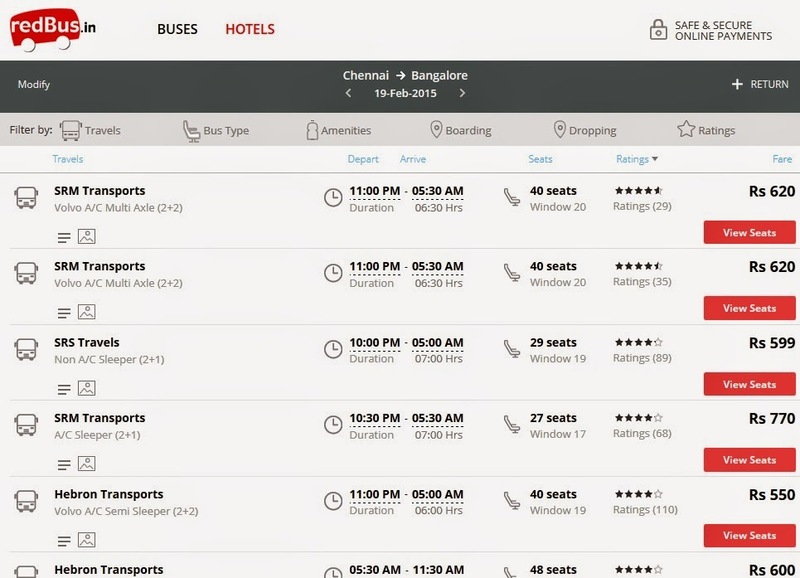 On a normal day, AC bus fare is about Rs 600-700 in both KSRTC and private bus operators. Refer screenshot. Only on select festival days, long weekends price goes through the roof for last few seats, but that shouldn’t be a basis for lifetime decision like buying a car. 4. What about the cost of ownership? If I buy a car I need to spend on EMI, maintenance, insurance etc etc forever. In public transport I have none of these liabilities. This cost of ownership should be factored while comparing. So with above corrections applied, below are the realistic cost when traveling between Chennai and Bengaluru. Assuming no parking/traffic violation fine is incurred. One person or 7, cost in a car is almost same, but makes big difference in public transport. For one or two pax, public transportation is the cheapest. I am better off using public transport and renting a car on need basis, than incur this massive expense every day. As you can see above, it effectively costs Rs 2.5k for one person to reach Bengaluru from Chennai in a Mobilio, much more than what the ad claims. Cheapest mode is by Non AC train. When there're about 3-4 people, the cost of AC public transportation and Mobilio ride breaks even. 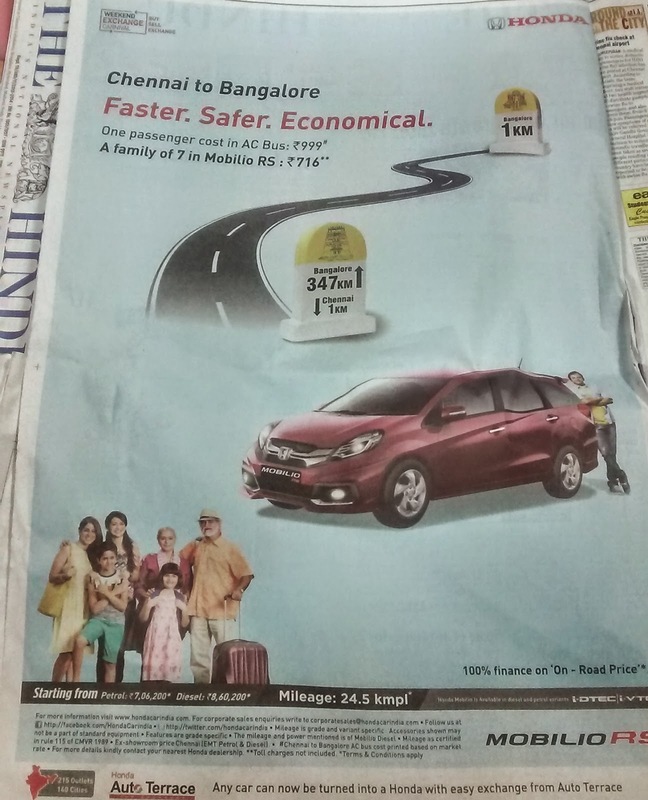 The ad forgot one very important cost of driving from Chennai to BLR: the RTO catches non-Karnataka vehicles and can (wrongly) make them pay Life Time Tax for KA which is about 1.2lakhs for a Mobilio. Factor that into the cost of travel and driving up would cost considerably more. Perhaps Honda should have made the ad advising its Chennai customers that if they frequently visit BLR, it is more economical to buy a Mobilio in BLR rather than in Chennai! Well, nice write up, hope you see something fishy in vehicle sales numbers as well, which come up in popular websites/magazines. quoting 5k bookings per month etc etc. or do you think they are all accurate.